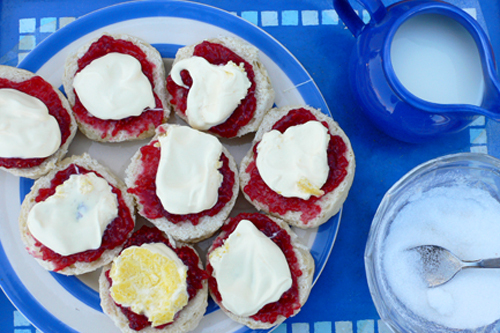 A clash between the Cornish and the Devonians whether it is best to put cream or jam on the top of a scone. Well, down in Cornwall we put jam and then cream on top but up there in Devon they do it visaversa. Why they choose to do it this way I will never know but we will leave them to it. But surely, as the cream warms up the jam slides off?! But they know best so that’s that, enough is enough…. But, here’s a picture taken west of the Tamar and they have done it proper. See?! Anyhow so long as it tastes lovely, who cares! The traditional Devonshire way states that scones should be cut in two and then clotted cream added followed by strawberry jam. In Cornwall, the cream tea was served with a ‘Cornish Split’ a sweet white bread roll, then buttered, followed by JAM then Clotted Cream.